There are two types of treatments for the removal of superficial vessels: SCLEROTHERAPY and LASER THERAPY. Advanced planning and treatment of spider veins with Sclerotherapy is popular in the winter months as it will leave you prepared for the skin-bearing summer! Sclerotherapy is done in thirty-minute sessions with the number of veins injected varying by size and location. As many as 50%-80% of injected veins may be eliminated per session of sclerotherapy. Depending on the quantity and severity of the vessels, our recommendation for the number of treatments will vary. In general, spider veins respond in 3-6 weeks, and larger veins respond in 3-4 months. Treatment sessions are usually 4-6 weeks apart. Veins that respond to treatment will not reappear. However, new veins may appear at the same rate as before. If needed, you may return for touch-up injections. Laser therapy is specific to targeting the blood within the vessels of the spider veins. 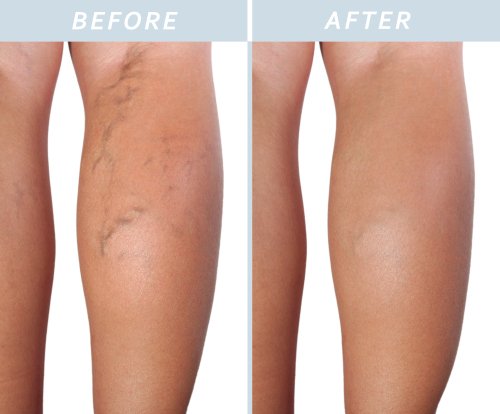 It can be effective for areas of thinner skin with visible spider veins, or as an adjunct treatment after sclerotherapy for residual traces of vessel remnants. Multiple treatments are usually necessary, and these treatment sessions are approximately 4-6 weeks apart.